When I did a search on “faith” in the Bible I received 231 occurrences of faith or some other form of that word. That tells me that God must place much importance on faith if He uses it that many times to communicate with us through His Word. Narrowing down my search I want to share just 10 examples of faith in the Bible. Hope in the Bible is illustrated with and anchor. It is said to be steadfast and sure. Just as when you are on the water in a boat and you throw out your anchor you expect that it will hold you in that spot on the sea. 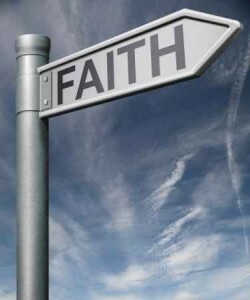 Faith is what we need for salvation because the Bible says we are saved by grace through faith (Ephesians 2:8-9). You can’t see it but it is faith that brings you to salvation. Some call this “saving” faith. Faith brings us to salvation and hope assures that our salvation is secure, just like an anchor. As we walk in the Spirit our faith grows. In addition to “saving” faith is faith produced as part of the fruit of the Spirit. As we walk in the Spirit our faith grows. Our good works and our attitude as a result of salvation help others to have that “saving” faith. This is what Paul is saying when he says that we should “work out your own salvation” (Philippians 2:12). When we wear our faith on our sleeve and we have the “mind of Christ” others will want to know about Jesus. As you read about faith in the Bible you will see that God promises that everyone has a measure of faith. This goes back to the idea of faith that grows. As a baby Christian we have that “saving” faith that God gave us His Son to satisfy our sin debt. The only way that your “measure of faith” can grow is for us to learn more about our God, Jesus and the Holy Spirit. The way that we do this is by reading God’s Word, the Holy Bible. Reading about what God said He would do and then reading about the fulfillment of those prophesies will increase faith. The Holy Spirit inside of you will continually bear witness that what you are reading is truth – God’s truth, thereby also increasing your faith. Just as a baby begins by drinking milk, we must begin our walk with the Lord with the milk of the Word (the simpler things). As that baby grows he begins to eat more solid foods, just as when our faith grows we are able to handle the meat of the Word (the more complex things). The only way our measure of faith can increase is by spending time meditating upon the Word of God. Moses led the Israelites through the desert for 40 days and 40 nights. During that time faith decreased. In fact, the Bible tells us that Moses’ faith decreased so much that he never entered the Promised Land. Instead, God declared because of Moses’ lack of faith that only the people who were 20 years of age and younger would enter in. The new generation was led by Joshua, a man of faith. I have only scraped the surface and as you can see faith is a popular and powerful concept in the Bible. Faith in Jesus and in the promises of God brings joy unspeakable. Have you trusted your life to Jesus. My prayer today is that you accept God’s gift of grace and become a child of God. A fine article, but a few mistakes cast doubt on the remainder. Philippians is misspelled in your ref. to “Philippeans 2:12” and you state that Moses and the Israelites were in the desert for 40 days and nights instead of 40 years. Thank you Pastor Ron. It has been corrected, showing again on the Word of God is perfect. Your help is appreciate. glad to be part of this.